The unsustainable felling of rosewood at the savannah regions poses a threat to the smock industry as weavers may soon run out of traditional properties in the wood, which are used to dye some of the weaving materials. 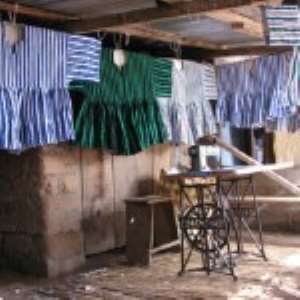 Smock weaving is a major economic activity for people in the Northern, Upper East and Upper West Regions with some of the weavers using properties of rosewood to dye materials. Records indicate that within a period of nine years (2004 to 2013), 110,000 cubic metres of rosewood were felled in the country, a level described as unsustainable as the tree takes a minimum of 40 years to re-generate. While there is a ban on harvesting of rosewood in the country, the Ministry of Lands and Natural Resources continues to license companies to transport lumbered rosewood from the savannah regions where the companies later export the wood. This came to light at the quarterly Baobab Market dialogue series in Tamale on Tuesday. The Baobab Market is a group of Non-Governmental Organisations in the Northern Region that meets to identify, discuss and adopt strategies to collectively address development challenges to enhance the wellbeing of the people of the region and the nation at large. Alhaji Osman Abdel-Rahman, Interim Chairman of the Baobab Market, described the unsustainable felling of rosewood in the savannah regions as giving away the local economy as the tree offered a lot of medicinal and economic benefits to people. Mr Sumani Babio Mohammed Awal, Executive Director of Centre for Active Learning and Integrated Development, described the rosewood situation as worrying calling on government and other authorities in regulating the sector to institute measures to salvage the trees in the forest.